Setterfield’s first book, Thirteenth Tale, was a wonderful story that I love and recommend but find hard to explain. With Bellman and Black, she’s done it again. The cover describes it as “a ghost story”, but I’d have a hard time explaining exactly who is haunting whom. William Bellman is a young man when his uncle takes him under his wing and begins grooming him to take over the family cloth mill. Thanks to skill, a little luck, and incredibly hard work, Bellman expands and eventually inherits the business. His personal life is likewise sucessful, until one day tragedy strikes. 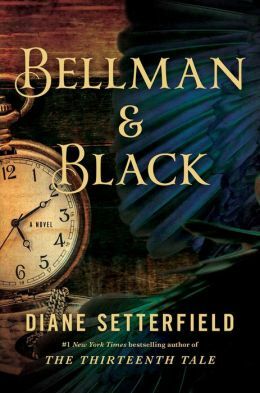 Mourning at the grave of his dearest loved one, Bellman meets a mysterious man named Black, who offers him an opportunity. Inspired, Bellman envisions a new business, which he names Bellman and Black. His business is successful beyond his wildest dreams- until one day, after years it suddenly isn’t. On the downward slope from a peak of success, Bellman begins to wonder who exactly his invisible business partner is, and what kind of deal he has made. Rooks figure largely in this story (if there is any specific ghost, it is a rook.) Death is part of life in this story. Color and the many shades of black are also a focal point. Summed up, it Bellman and Black doesn’t sound wildly compelling. Oh but it is! This is one of those books where the power of the story (and the beauty of the writing) is greater than the basic plot. Its true gothic Victorian-style horror- chilling exactly because so much is left implied. The descriptions of color, cloth and materials are especially lush. I lost myself thoroughly in the pages of description for Bellman’s business. If you want a story that is compelling, frightening, and gorgeous all at once, pick up Bellman and Black when it goes on sale this week. Maybe, in the end, its the story that haunts you…. You might like: Tiger’s Wife, Obrect. Bookman’s Tale, Lovett. Thirteenth Tale, Setterfield. This entry was posted in Fiction, Top 10 and tagged book review, death, fiction, ghost, victorian. Bookmark the permalink.